Home » Blog » Are bankrupt beneficiaries a risk to executors? Bankrupt beneficiaries are quite common. Executors need to be aware of how to deal with them. There are statutory rules about how executors should deal with bankrupt beneficiaries. Personal representatives who don’t follow the rules could face legal action. It’s an executor’s responsibility to know if a beneficiary is bankrupt. So, what can you do to protect yourself as an executor if there’s a bankrupt beneficiary? First of all we need to look at the reasons for treating this type of beneficiary with caution. Why are bankrupt beneficiaries different? Perhaps you’re wondering why you need to be specially careful when dealing with bankrupt beneficiaries? Why should their bankruptcy affect how you carry out your job as executor? The reason is, when a bankruptcy order is made, the bankrupt person no longer has the right to control their assets. Virtually everything they own comes under the control of an official who is appointed to be ‘trustee in bankruptcy’. 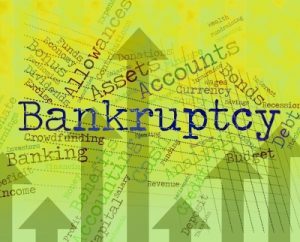 The Insolvency Act 1986* authorises a trustee in bankruptcy to claim the assets of the bankrupt person up until the bankrupt is discharged from bankruptcy**. That includes any gifts or inheritances the bankrupt person has the right to receive. Should executors delay transferring assets? You might well have a lot of sympathy for a beneficiary who’s run into financial problems and want to help them. Most bankrupt beneficiaries don’t want their inheritance to be used to pay off creditors. Some executors and bankrupt beneficiaries think there’s an easy way to avoid the trustee in bankruptcy. They agree between them to delay transferring the inheritance until the beneficiary is discharged from bankruptcy. But that’s not going to work. Just delaying transfer of the assets to the beneficiary isn’t going to prevent the trustee in bankruptcy getting hold of an inheritance. The legal right to an inheritance is known as a ‘chose in action’. That means it’s a right that can be enforced through the courts. When a person is declared bankrupt their right to receive an inheritance passes to the control of the trustee in bankruptcy. The trustee in bankruptcy can enforce that right against the personal representatives of the deceased’s estate and make them hand over the inheritance. What if the beneficiary wants to keep an inheritance secret? Not surprisingly, bankrupt beneficiaries often want to look for ways to hide their inheritances. A bankrupt beneficiary tells you they want to give up or ‘disclaim’ their inheritance. They might hope that it will be re-distributed to another member of their family who will secretly hold it for them until they’re discharged from bankruptcy. The Insolvency Act puts an obligation on a bankrupt to declare any assets he or she becomes entitled to receive during the period of the bankruptcy*. Executors who help beneficiaries to put assets out of the reach of the trustee in bankruptcy can end up in serious difficulties. Unfortunately, we can’t rely on bankrupt beneficiaries doing what they’re supposed to do; you have to make sure you protect yourself. A bankrupt beneficiary might try very hard to persuade you to transfer their inheritance either to them or someone they know by convincing you they’re going to declare it to the trustee in bankruptcy. But why should you take the risk? Don’t give in to pressure from a beneficiary. If you transfer the inherited assets to anyone other than the trustee in bankruptcy without getting formal authority, you will be personally liable. You’re unlikely to escape that risk by claiming you didn’t know the beneficiary was bankrupt. And you won’t be entitled to get reimbursed from the deceased’s estate if the trustee takes action against you. There are methods executors can use to make sure that dealing with bankrupt beneficiaries isn’t a risk. Even if there are no insolvent beneficiaries at the start of the administration of a deceased’s estate, there could be a bankruptcy that arises during the course of the administration. I’ve even known situations where beneficiaries have got themselves into serious financial trouble because they’ve got carried away with the anticipation of getting an inheritance. One other point to notice is that, if the trustee in bankruptcy fails to follow the statutory rules the trustee might not be entitled to claim a bankrupt beneficiary’s assets. Executors should check first before transferring a beneficiary’s inheritance to the trustee in bankruptcy just in case the trustee hasn’t complied with all of their obligations. an executor’s responsibility is to be impartial and administer the deceased’s estate correctly – even if that’s detrimental to a member of the family. There are ways you can protect yourself when dealing with bankrupt beneficiaries and actions you must take. I can show you the steps and give you tools to help you. Read more here. Personal representative is a legal term for a person authorised to administer a deceased person’s estate either by appointment in a will or under the intestacy rules.